In May 2017, I accepted Almighty God’s work of the last days. After I joined the church life, I saw that my brothers and sisters took God’s words as their principles for action, and that they sought to be honest people. Whenever they had a difficulty or problem or corruption, they would open their hearts to each other, seek and fellowship about it, and they would help and support one another. When I was with my brothers and sisters, I felt very relaxed and free. As I was being watered by God’s words, I came to understand more and more truths, and I really wanted to play my part in the spreading of the kingdom gospel so as to repay God’s love. And so, I began to expend myself enthusiastically for God. But just at that time, my family read the Chinese government’s rumors online which condemned and discredited The Church of Almighty God, and they began to oppose my belief in God. Hearing me speak, my husband said with a sullen face, “If you absolutely have to believe in Almighty God, then we won’t try to stop you. But you’re not to keep the family’s bank cards any longer, so give them all to me!” When my husband said this, I felt an inexpressible emotion well up in my heart, and I thought: “We’ve been married for over 30 years, and I’ve always kept the family’s bank cards. I never imagined that my husband would stop trusting me because he’s believed the CCP’s rumors. I feel so hurt! Oh, the Chinese government is so evil. My family used to be very supportive of my belief, but because the CCP fabricates rumors and slanders the church, my family has been thrown into such chaos!” Afterward, so as to dispel my husband’s worries and stop him from trying to obstruct my belief in God anymore, I gave him all our bank cards. After some time had gone by, my husband saw that I was still persisting with going to meetings, and so he came up with a new trick to stop me—he started to follow me wherever I went. Because my husband was following me around all day, I couldn’t go to meetings and I couldn’t answer telephone calls from my brothers and sisters. All I could do was read God’s words by myself at home. But it was impossible for me to read them when my husband was at home, and so I felt like I was under house arrest, without any personal freedom whatsoever. One day, I couldn’t bear it any longer and I argued with my husband. Unexpectedly, he said to me angrily, “If you keep going to this church, then we’ll get a divorce! It’s your choice!” Hearing my husband say he wanted a divorce, I felt incredibly hurt. We’d been married for over 30 years and he’d never once mentioned divorce before, and yet now he was using divorce to strongarm me into giving up my belief in God. I felt so upset. But I knew that believing in God and worshiping God was heaven’s law, and I couldn’t leave God no matter what happened. And yet I didn’t want to give up my family either. If we really did get divorced, how would I live? Thinking this, I felt all conflicted, and I didn’t know what to say to him. Just then, my son and his wife also advised me not to go to meetings anymore. Seeing my whole family opposed to my belief in God, my heart weakened a little and I wondered why it was so hard to believe in God, and whether my life thereafter would always be that way. But no matter what, I had to believe in God. So I thought about it and decided to just keep reading God’s words at home, and not to go to meetings for a while. Afterward, I often prayed to God about my difficulties, asking Him to guide me through this situation. 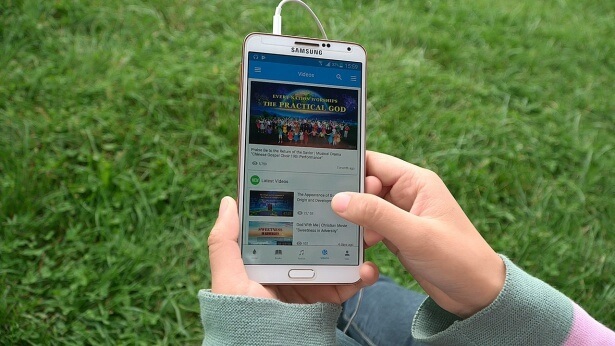 My brothers and sisters would often send me God’s words and videos as well, and so every day I would avoid my husband and read God’s words and watch videos on my cell phone. The more I read the words and watched the videos, the more enjoyment I felt. Especially when I watched brothers and sisters singing and dancing in praise of God, I would feel so moved that tears would pour down my face—I longed so much to be one of them. Later, I watched some videos about the CCP arresting and persecuting brothers and sisters, and I saw so many brothers and sisters in prison suffering the cruel tortures and torments of the CCP police. Yet still they relied on God and looked to Him, and these experiences of standing firm in their testimony to God even at the cost of their own lives moved me terribly. Compared to the cruel tortures and torments my brothers and sisters were going through, all that had happened to me was that my family was opposing me and obstructing me. After a little suffering, I had become weak and negative and had complained of my great woes and stopped going to church. I felt so ashamed, and the experiences of my brothers and sisters encouraged me greatly. In one of the videos, there was a passage of God’s words which said: “Thus, during these last days you must bear testimony to God. No matter how great your suffering, you should go on to the very end, and even at your last breath, still you must be faithful to God, and at the mercy of God; only this is truly loving God, and only this is the strong and resounding testimony” (“Only by Experiencing Painful Trials Can You Know the Loveliness of God” in The Word Appears in the Flesh). In an instant, God’s words had given me faith, and I understood that these tribulations that had befallen me were truly God testing my devotion and obedience to Him. I had to rely on God like my brothers and sisters did, so I asked God for faith and strength so that I would not be constrained by my family any longer, and so that I could stand firm in my testimony to God. One day, I went for a walk by the river, and for some reason my husband was not following me that day. Unexpectedly, I happened to bump into Sister Jin from the church, and she immediately asked me why I hadn’t been to meetings in so long and why she hadn’t been able to get in touch with me. I told her all about my current plight, and she took me to her home and read to me God’s words: “In every step of work that God does within people, externally it appears to be interactions between people, as if born of human arrangements, or from human interference. But behind the scenes, every step of work, and everything that happens, is a wager made by Satan before God, and requires people to stand firm in their testimony to God. Take when Job was tried, for example: Behind the scenes, Satan was making a bet with God, and what happened to Job was the deeds of men, and the interference of men. Behind every step that God does in you is Satan’s wager with God—behind it all is a battle” (“Only Loving God Is Truly Believing in God” in The Word Appears in the Flesh). Over the days that followed, I went to work out at the gym every day, hoping for the chance to attend a meeting. When I first started to go to the gym, my husband would still follow me. But as time went on, he saw that I was no longer going to church, and he relaxed his vigilance. In this way, I would go to meetings whenever I could, and would read God’s words and preach the gospel together with my brothers and sisters. My heart felt so much more at ease, but I was still constrained by my husband at times. When the meeting was over and I returned home, I saw that my son and husband were home, and I decided to have a frank, open talk with them. But when I was just about to speak, I hesitated, worrying that they would try to force me to give up my belief again. I realized then that I still lacked faith in God, and so I immediately prayed to God and asked Him to give me faith and strength. After I’d prayed, I read these words of God: “You should know that all things in the environment around you are there by My permission, I arrange it all. See clearly and satisfy My heart in the environment I have given to you. Do not fear, Almighty God of hosts will surely be with you; He has your back and He is your shield” (“Chapter 26” of Utterances of Christ in the Beginning in The Word Appears in the Flesh). God’s words gave me faith, and I thought, “Yes, with God as my staunch backup, what is there to fear? I will stand on the side of truth and bravely choose my own path.” Then, with a steadfast attitude, I said to my husband and my son, “I’ve been going to meetings again lately, and since I have affirmed that belief in God is the right path to follow in life, I must continue to follow it. I’ve worked hard for this family for over 30 years, and now all I want to do is spend the time I have left earnestly believing in God. If you’re still against me believing in God and you force me to choose between my family and my belief in God, then I would rather divorce than give up my belief.” After I’d spoken, my husband and my son both stared at me in astonishment, and neither said a word. After a few moments, they both left and went about their own business. Although neither of them had said a word, from their expressions, I realized clearly that they would no longer be trying to obstruct my belief in God. A while later, my husband gave me all the family’s bank cards to keep. Neither he nor my son ever said anything against my belief in God again, and my family regained the peace it had enjoyed before. Now, I can freely read God’s words, watch videos and listen to songs of praise for God every single day. During this spiritual war, because my family were deceived by the CCP’s rumors, they had tried to obstruct my belief in God. I had felt pain and weakness, but I got through it. What I came to feel most of all was God’s love and salvation for me, and I came to appreciate the authority and power of God’s words. At the same time, I came to have discernment of Satan’s insidiousness and poison. With this experience, I now have more faith to follow God! Thanks be to God!